The Catholic Jedi Academy: "He Made The Sea, It Belongs to Him, The Dry Land, Too..."
"He Made The Sea, It Belongs to Him, The Dry Land, Too..."
NASA has recently released stunning photographs of the Earth from outer space. 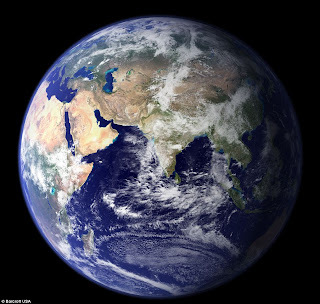 The pictures were taken by Terra, a satellite orbiting 435 miles above the Earth's surface. Yet you have made him little less than the angels, and you have crowned him with glory and honor.